How does Adobe's automatic Optical kerning work? Whether you like it or not, it's still pretty impressive for a built-in function. I doubt that Adobe will tell you much, but you might find Igino Marini's articles on the subject for his iKern Service of interest. Adobe bought the patent for the Hermann Zapf algorithm from, I think, URW. To do it justice, aside from kerning based upon letter shapes, scales glyphs in accordance of the justification settings. You can probably find the patent and read all about it. As far as its utility/quality? The HZ algorithm isn't a be all, end all. Again, in part this is because of the user's ability to set glyph scaling extremes and is often set too marrow/wide. Using just a couple percentage points +- off of 100% produces decent justification. In ragged right text I find it not so great to scale at all. Even so, one can set text in ID perfectly fine using decently kerned fonts using metric kerning. I prefer it over the HZ kerning. Also note that Adobe often tweaks the algorithm. So one finds out that with previously finished work, if one goes to update it in a newer ID version, reflow can/does occur. This does not happen with metric kerning unless one updates the font and that the font has itself updated kern tables. If acceptable spacing and kerning were usually possible using something like the HZ algorithm, no one would take the considerable time and effort it takes to do it manually. A better term than “Metrics” would perhaps be Native, In-font, or Foundry. However, I do like the idea that it is size-specific, making the name “Optical” appropriate, in as much as we refer to optical scaling. For sans serif faces spaced for text, Optical kerning may in fact be better for display sizes (if you don’t like to see combinations such as r_t and v_y overlapping). I’ve railed against this before, but maybe it’s time to do it again for a new generation. One needs to evaluate the results of applying Optical Metrics to a setting very carefully. Although it may have its uses, as Nick alludes to, they are extremely limited, in my opinion. Applied to text set in a well-spaced font, the algorithm will do more harm than good. Take the example of Miller Text. I think we can all agree that Matthew Carter is an accomplished type designer and a master of fitting. Notice how it chooses to push the straights apart, while closing up the it and iu pairs, completely disrupting the balance of the positive-negative pattern/rhythm. Someone explain to me how this is any improvement. As I am fond of saying, “Optical” does not necessarily mean optimal. What it does not seem to consider (though it should, especially for serif designs) is the rhythm of stems. Sure, but . . . Really? In what way do you think it considering this? @Kent Lew I'd guess the minimum distance takes precedence over total whitespace. What's the problem? The results are the problem. 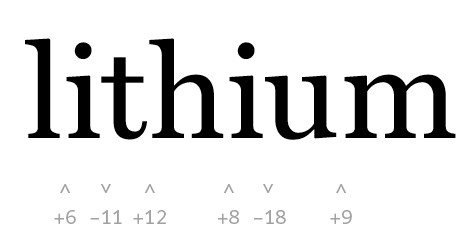 That second “lithium” is a poorly spaced word. And not a particularly challenging one at that. Which is why I have trouble believing that the Adobe Optical Metrics algorithm is the HZ routine. I’ve seen the results of the HZ routine, as implemented in URW’s Kernus many years ago, and I thought it was pretty damned impressive. Adobe’s implementation, however, is not. I've never seen this before but it looks pretty impressive indeed (taken from wikipedia, link below). It looks to be about a lot more than kerning though, but kerning is definitely a part of it. Yes, Hz dealt with various aspects of layout, not just kerning. Hz multi-line justification algorithm is the basis of Adobe's 'paragraph composer'. Interesting term "a creek". In this example I think it more a "lake". I used URW Kernus quite extensively back in the day and the results were impressive. A fair amount of subtle horizontal scaling of letters was present. I think the Wikipedia image is a strawman image (so to speak). I didn't try MS Word, but nothing I use daily sets that text in the second column so loosely in its worse areas. As well, the first line indent is a bit wider in the second column than the first. Overall, both ID and QXP set those 3 paragraphs similar. 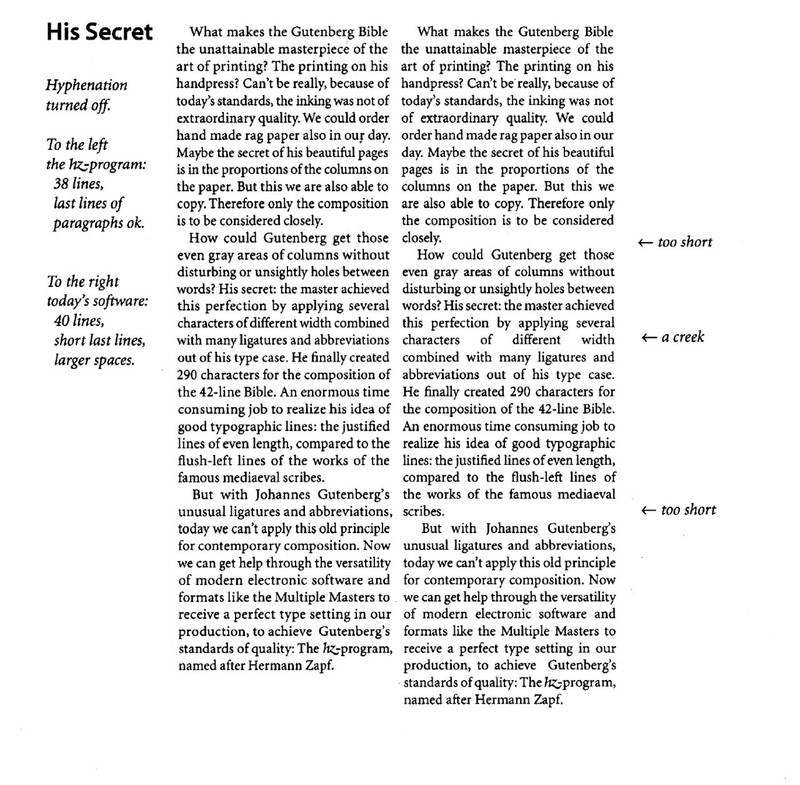 In fact, if one sets this in ID using glyph scaling and optical kerning using the paragraph composer, 10pt Minion Pro on 11pt leading in a 2.1" column that recreates the text flow/line breaks, and actually prints it, one will see the first paragraph is a bit darker than the other two paragraphs. Of course, I have no idea what the settings were in the Wikipedia image but did use identical settings between ID & Q. In Q, the 2nd and 3rd paragraphs are near enough identical to the ID sample. Paragraph #1 is set looser overall than the ID paragraph and, if anything, is a touch looser than I would leave it (all but the first 3 and the last 2 lines are visually identical to ID). But the color is a bit more balanced to the last two paragraphs. All this to say that automation will not at this time replace human judgment when paging a layout. ID can, with modest settings for glyph scaling and optical kerning, do well, though. But it can run amok and must still be reviewed and action taken. To me, the HZ justification is white-bread bland. The setting with widows looks much more appetizing. And nutritious. Or one might say: a landscape with creeks, more scenic. Something else to test in the laboratory, for speed and retention. But how to test for pleasure?